We use simple ingredients including pure cane sugar and real butter. Our taffy does not contain high fructose corn syrup or salt. All varieties excepting chocolate and peanut butter contain less than 1 gram of fat. Chocolate and peanut butter contain 1 gram of fat. Additionally all of our taffy flavors are gluten free. Each stick contains 120 calories. Do you use preservatives in your taffy? No! We only use high quality ingredients with no added preservatives. Yes, please click here for wholesale ordering information. How long will my taffy stay fresh? Taffy has a long shelf life. For best quality eat within 6 months of delivery. How do I store taffy? 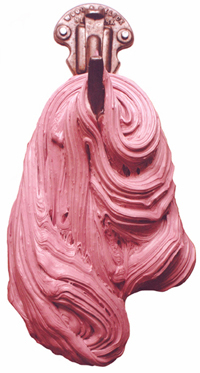 Taffy is best enjoyed at room temperature. If you live in a very hot climate, you may want to place your taffy in the refrigerator for a few minutes for ease of removal from the wrapper. What is the difference between your taffy and salt water taffy? We do not use salt in our taffy. We like to let our flavors stand on their own. Once you taste them, we believe you will agree! Additionally no sodium is a plus from a health standpoint. Salt water taffy originally got its name in the late 1800s from a small girl who bought taffy from an Atlantic Ocean front candy store that had recently been flooded. Click here to read the full Wikipedia article. Do you take custom orders for custom flavors or colors? We will be happy to discuss your ideas for custom flavors, colors or labels. Click here to send an e-mail inquiry or call us at: 805.460.9871. Yes, please click here to contact us for private labeling minimums and rates. We take your privacy concerns seriously. We do not make available or sell your information to any third party. Your credit card information is processed through a safe and secure credit card processor.